This fantastic day Gimignano Wine Tour excursion is designed for food and wine lovers staying in Siena and looking for a short taste of the Tuscan countryside. 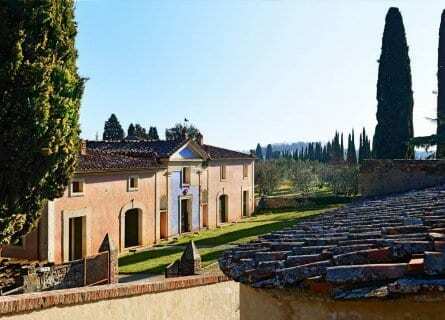 On this private chauffeured tour you will head north from Siena and visit a beautiful winery in the Chianti wine lands such as San Fabiano Calcinaia or Felsina, you will enjoy an excellent traditional al fresco lunch in Castellina and a wonderful excursion to medieval San Gimignano, one of the most picturesque villages in Italy. The Chianti Classico appellation is located between Siena and Florence around the villages of Radda, Castellina, and Gaiole. It is the quintessential romantic Tuscan Wine Country you imagine with fairy tale castles crowning hilltop villages and lush valleys blanketed in vineyards. After a marvelous VIP winery visit and tasting in a historic cellar and convivial lunch, you will head to the darling village of San Gimignano where you will enjoy a private guided tour of this lovely town’s most cherished gems such as the medieval towers, the outdoor frescos and much more. On the way back to Siena you will stop for a digestivo or coffee in the remarkable walled hamlet of Monteriggioni. Arrive at your hotel in Siena in the early evening. Looking for an excursion from Siena that includes top food, wine, culture and sightseeing and all with the luxury of your own driver? 10 a.m. Your elegant driver will pick you up from your hotel or villa in or around Siena. Travel out of the city and into the wine country, stopping near Castellina to visit a wonderful cellar such as San Fabiano Calcinaia or perhaps Felsina, both stellar estates. You will enjoy a walk through the vines and a full tour of the vinification rooms and barrel chambers, followed by a superb tasting of wines. What a way to spend the morning! Lunch will follow at one of our favorite trattorias in Tuscany, near Castellina. You will enjoy classic specialties like Crostini, delicious bruschetta drizzled with olive oil and of course fresh pasta and Riserva quality Chianti wine from one of the best cellars. You might finish the meal with homemade Panna Cotta. This is a real treat. After lunch, you will want to stretch your legs and walk off the Vin Santo, and a private guided walking tour of enchanting San Gimignano is in store for you. Enjoy a loop around the village, taking in the lovely Collegiata, the Piazza della Cisterna with its 13th-century cistern, and head to the Rocca- the castle fortress- for spectacular views over the ancient towers. You will have some free time on your own as well to take in the boutiques, art galleries, and charming gourmet shops. On the way back to Siena you will stop at the amazingly preserved hamlet of Monteriggioni, set amid vineyards and enclosed by a medieval wall. This little town is a great place to take photos, go for a walk through picture-perfect streets, have a quick coffee or gelato, or perhaps another last vino for the day. You will be dropped back at your hotel by about 6 p.m.